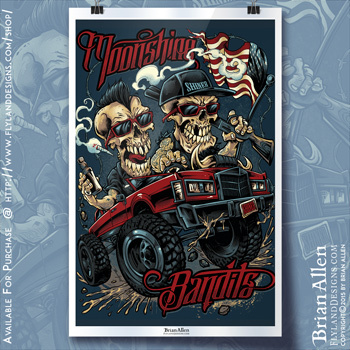 I was lucky to work for the amazing band Moonshine Bandits on their new T-shirt design. For a limited time only I am selling 100 11×17 prints of the T-shirt design signed by Brian Allen the original artist. super stoked about grabbing this while it’s available! was lucky to get the guys to sign mine too! That’s so awesome that they signed it too! Proud to have my name next to theirs – if you ever post a picture of that on social media, please tag me so I can see it too!